As 2018 starts, we take a look at one of our favourite topics of conversation – integration - and what the industry has to say about it. We look at why printers ARE and AREN'T integrating, what problems they’re facing and what the leading vendors have to say about integration. We also cover xJDF (the new version of JDF), Industry 4.0, the Cloud and the emergence of marketing automation integrations. 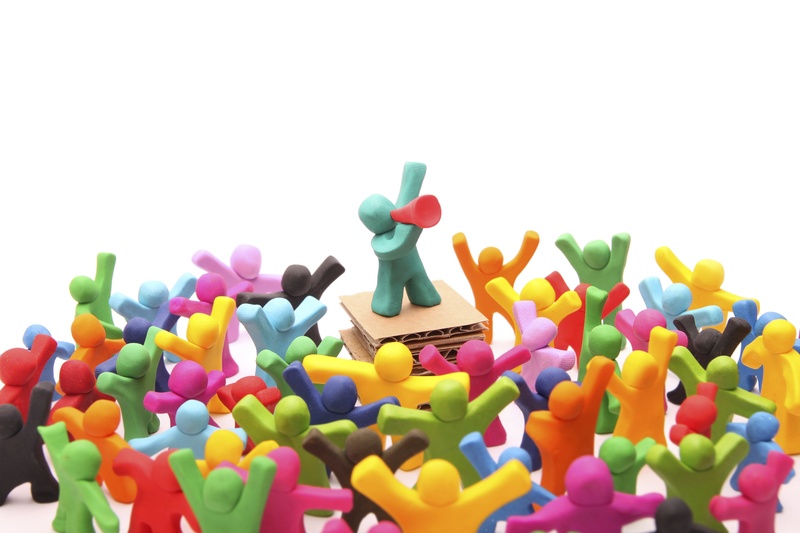 Demand for a higher number of smaller print jobs has increased – 22.6% of print companies say this is one of the biggest issues in their workflow. They are also under pressure to do jobs quicker – 23.6% of printers said that this was one of the biggest issues in their current workflow. Having an MIS in place will guarantee the quality of work will stay high. As soon as the MIS is up and running with the printer’s specifications, these will always stay the same – standards will not slip. 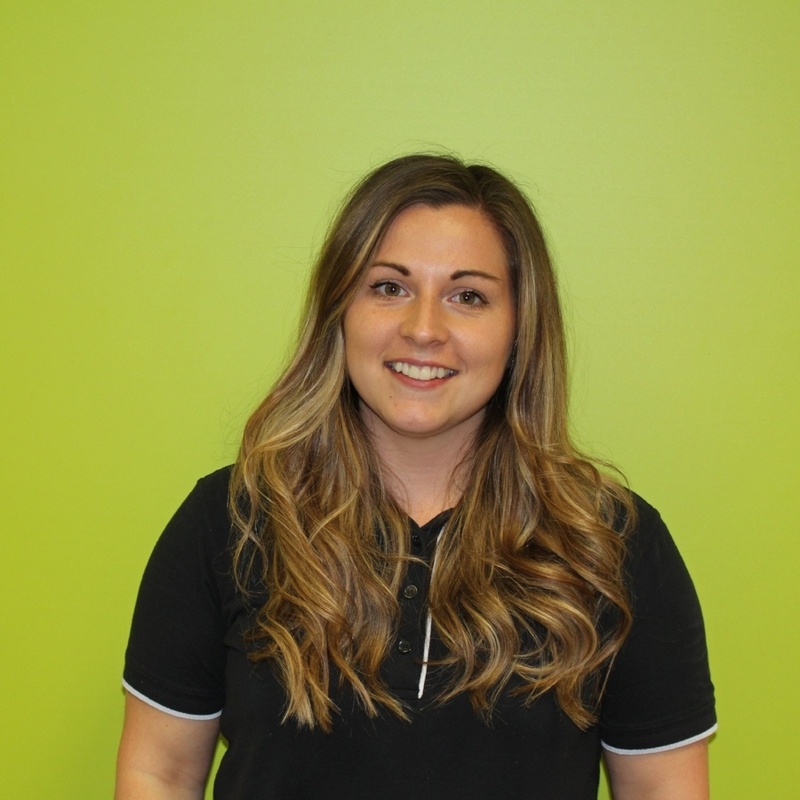 Staff are often motivated by an automated workflow, it allows them to make the most of their time, and concentrate on their strengths/be more creative, instead of having to do repetitive and mundane tasks. 73% of customers wish to connect with real people instead of an automated message. Having an automated system frees up time from carrying out administrative tasks and allows staff to put their efforts into building customer relationships. Of printing companies who said their revenues have increased in the past 5 years, 41.9% believe it is down to their investment in software to increase automation. On average, printing companies say that 31.4% of their print volume is produced using a 100% automated workflow (no human involvement) whereas 32.8% is done through an online portal. Only 4.2% of printers say they have no issues with their workflow as they are 100% automated. A report put together for the printing industry in America, the Print Factory whitepaper, offers some interesting insights into the topic of integration and automated workflows. The most recent run of the report found that astonishingly, despite the problems printers can have without an automated workflow, only 8% of printers do have a fully automated workflow, and most printers haven’t increased the amount they spend on software – averaging around $35,000 per year. Almost a third (31%) of print companies in the US believe that investment in automation software is the answer to their productivity and workflow challenges, but despite that percentage, only 18% say that by 2019 they plan to be fully automated. The biggest barrier to integrated workflows seems to be incorrect artwork. In this article we mention how one of our customers reported that around 80% of the manual adjustments they have to make to artwork is down to incorrect specifications from the customer at the time of estimation. And if a job is sent to Prepress with production specifications that don’t match the artwork file, the workflow essentially ‘breaks’. The problem is that printing companies can end up producing a price for an automated job that actually requires manual intervention. Suddenly, the profitability of that job has shrunk. Middleware tools such as Enfocus Switch and Esko’s Automation Engine are becoming increasingly popular as a method of automating tasks such as remote approvals and artwork preflight checks. Their benefit here is in removing the barriers created by incorrect artwork, allowing the majority of jobs to flow from the MIS to press without manual intervention. There has been an increase in vendor collaboration which is driving Industry 4.0. It is an important development and a positive move away from the mentality of ‘we didn’t invent it so we don’t want to use it’. The more companies collaborate, the more customers will benefit from a range of expertise from different providers. In September 2017, Print Business held a round table meeting to discuss the benefits and challenges of integration and automation. Industry 4.0 is becoming an increasingly popular topic of discussion in the printing industry. The term is used to address the way the industry is evolving as printing companies move over to a more digitised, automated way of working. Otherwise known as ‘the fourth industrial revolution’, it’s a transformation that’s working its way through every sector of manufacturing. The ultimate aim of Industry 4.0 for a printer is to create a ‘smart factory’, which means cyber-physical systems must communicate with each other and with decision-making humans in real time. This will not be easy to achieve in the printing industry; the printing process is never a one-size-fits-all and it involves many different people. To turn an idea into a printed reality, a lot of interrelated decisions have to be made, and that’s why system integration is such a key component for Industry 4.0. JDF is an XML-based file format which was created by CIP4 to create a common language that would make cross-vendor workflow implementations easier. However, the industry had some issues with JDF – there were multiple ways of inputting and describing things, which made it more difficult than it was supposed to be. xJDF is a much simpler version of JDF and has been created from a combination of industry feedback and experience from those who use JDF and the problems they had with it. There is only one way to create a job ticket with xJDF and everything has its place. A major breakthrough with xJDF is that it can support product ganging, which wasn’t possible with JDF – JDF was one job for one product, xJDF can handle many products in one job. Integrations with web-to-print solutions have become increasingly popular. When fully integrated into an MIS, a web-to-print solution can remove a significant number of touchpoints. With our Infigo integration, which uses our API, the customer can now create their own quotes using real time MIS specifications and pricing, rather than just ordering pre-defined products. In the US, more than 50% of printing companies have adopted the web-to-print process and are consistently increasing their sales. According to market analysis, in 2017, printing companies will gain 30% of their revenue through the web-to-print market. There was a 42% and 46% jump in print volumes originating via web-to-print and being produced in a 100% automated, touch-free workflow, respectively. Around a third of total print volumes are now entering shops online and being produced without operator intervention. Integrating an MIS with marketing automation software is a new consideration for the industry, as printers seek to include their marketing teams in their integrated system. According to Autopilot (2015), marketers who use automation software receive twice the number of leads than those using blanket email marketing. Over two thirds (67%) of B2B marketers have seen at least a 10% increase in sales opportunities through lead development via marketing automation. Back in July 2017, it was reported that 142,000 businesses are now using marketing automation software, which has resulted in a 14.5% rise in sales productivity. The cloud is a growing topic of interest for the printing industry. 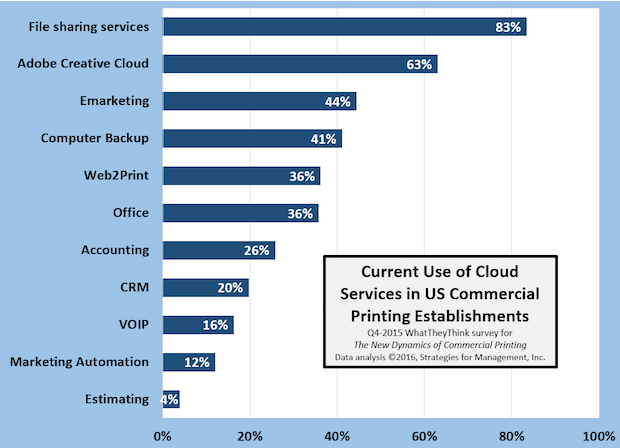 WhatTheyThink.com conducted a survey on US commercial printing establishments, in 2015, and the graph shows what services the printing establishments use the cloud for. They also found that the bigger printing companies use cloud services more than others, but the difference is narrow. Cloud based services are popular for things like file sharing services, and e-marketing, but only 4% of printing companies use the cloud for estimating. As detailed in this Printing News report, the industry is continuing to embrace Industry 4.0 and the move into cloud-based computing to evolve how certain parts of the workflow is managed. For example, there’s a trend towards data being captured from the print production workflow and sent to cloud-based Business Intelligence software. This provides insight for printers to make better decisions and track KPIs. The reasons for integration have not changed in 2017 – printers typically head down this route when they need to deliver a higher number of smaller print jobs in a quicker time. It’s no wonder then, that take up is good. Almost a third of US print companies believe that investment in automation software is the answer to their productivity and workflow challenges. But despite that percentage, only 18% say that by 2019 they plan to be fully automated. The main reported reason for this was a lack of in-house IT skills to help manage the project. Various technologies are being used in integration projects, including middleware software such as Enfocus Switch that allows printers to self-automate. Adoption of web-to-print solutions continues to grow, with more than half of US printing companies adopting the technology and nearly a third of revenue being generated through this market. And while integration to marketing automation is in its infancy, this is something the industry needs to give further consideration to if we want print to “be a force to be reckoned with” in today’s cross-media marketplace. The concept of Industry 4.0 has been a hot topic recently and we’re seeing the term increasingly used when referring to the industry’s progression towards the ‘Smart Factory’ – one that uses technology and data to increase efficiency. So, it’s no wonder that IT resource is a key theme. While a more collaborative approach from vendors and the launch of xJDF looks set to make integration projects easier in 2018, the lack of in-house IT skills will continue to be a barrier to success. This was an underlying theme throughout the year and reflects a need for printers to stop underestimating the investment that is needed on the IT side of their business, and accept that this is where the future wins will come from. Pat McGrew, Director Ryan McAbee, Associate Director (2017) European Production Software Investment Outlook, Software & Services Trends and State of Business Transformation edn., : InfoTrends.